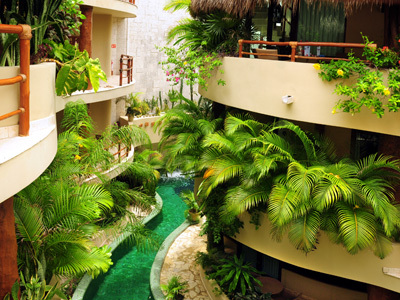 Are you planning on vacationing in Playa del Carmen, Mexico and need a place to stay? Make sure to check out our award winning condo hotel properties with all of the amenities you would expect from a luxury rental. 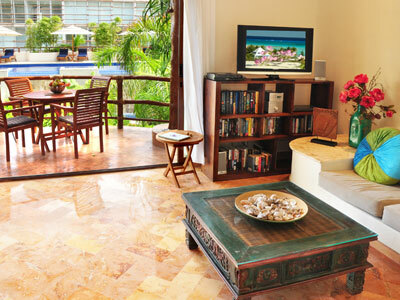 All of our 5 properties are located in the Premier Zone of Playa del Carmen. Also make sure to browse through our site to find great tips and information on restaurants, tourist attractions and activities to do while in Playa. Featured: Unit 341 is the largest 1 bedroom unit closest to the beach, with spectacular views of the turquoise blue waters and white sandy beaches, that can be seen from all the rooms! Featured: Unit 202B is one of the largest (1400 sq feet) 2 bedroom/2 bathroom units with ocean views from living room, kitchen and balcony, 2 living rooms and a large kitchen with eating area. There are large private balconies off each bedroom and another off the kitchen and living room. Featured: Unit 216 is one of the largest 2 bedroom, 2 bathroom condo’s in Porto Playa, with the best view of the pools, jacuzzis and tropical gardens. Located across the street from El Taj Oceanfront, the El Taj Beachside condos have private terraces that are surrounded by exotic plants and lily ponds, which all face the pool and cascading waterfalls. 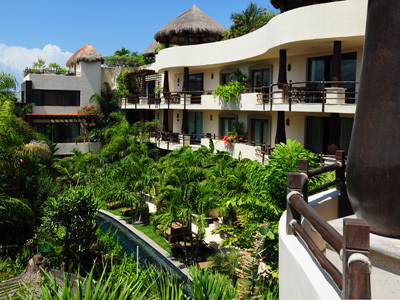 Maya Villa has 16 condos, all with large private balconies facing a gecko shaped pool and jacuzzi. One wall is a waterfall into the pool. The theme is Mayan with spectacular lighting and gardens. Wow! This place was perfect! The location cannot be beat! We vacationed with 2 other couples and the accomadations were nothing short of luxurious! The best restaurants were in walking distance. Be sure to try the Italian Restaurant Casa Mediterriana! Great conceierge; told us the best places to go. So much better than staying in a hotel. Loved the beach club and free beach chairs that were just like beds on the beach. So trendy and fabulous! We cannot wait to return! I have stayed in Porto Playa Condos since they were built and even after all these years they are still the place to stay. 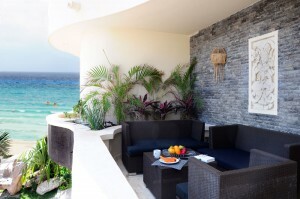 Playa has many new condos but as far as location and overall beauty this is the place to stay. There is really not a bad unit in the complex. The best is any of the 3 bedroom penthouses. It is perfect for friends traveling together and great place for a family as well. The rooftop palapa’s a hot tubs are a great addition to any party. You also get use of the beach club at El Taj which is one block away and the service and food there is very good. For those of you that have been staying away from Mexico for all the media hype about the problems I am thankful because the rates are back to normal. Are there problems in Mexico, yes but the word to the wise is just don’t do anything that would put yourself in harms way just as you would do at home. Tremendous Value: Great property, nice rooms, well located, very reasonable rates (May is off-season, and we were able to get an additional 50% off, as we booked only about four weeks out). Great Pool: The pool was reported to be the best in the city and we loved it. The lower pool initially looked too small to be functional, but it turned out to be a perfect option for our young son who was just learning to swim. It’s Quiet: Although we were in the city and close to some nightclubs, the property was extremely quite and tranquil. It was a beautiful oasis in the heart of the city. We were in bed early every night yet never heard a thing. Excellent Service: The housekeeper came by daily and did a meticulous job cleaning the room. The staff was friendly and was relatively quick to respond to any requests. Congratulations on the Choice awards from Trip Advisor. It’s amazing and you guys really do deserve it! Send our regards to all the beach attendants who are really the best (especially Juan). Although we love El Taj Ocean, I have to be honest and tell you we love Porto Playa as much, but for different reasons. We recently wrote a great review because we think Porto Playa should be ranked #3 on Trip Advisor. Keep up the great work! See you soon…we’re rounding up a group of friends and I am trying to persuade my friends to buy a condo with us at Porto Playa or Maya Villa! 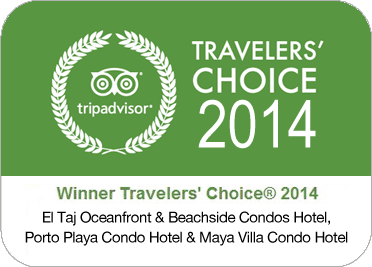 A big congratulations on your recent TA Travelers Choice award. I know how hard it is to reach a level of perfection and what it takes to maintain that achievement each and ever day. You guys are doing a great job. We just returned form a friends wedding at the One and Only Ocean Club in the Bahamas and as much as I was impressed, they were not able to give it that special touch of “vous faire sentir spéciale” that you all have. You truly have the perfect combination of staff, accommodations and service and in my opinion should be rated number 1 on TA. 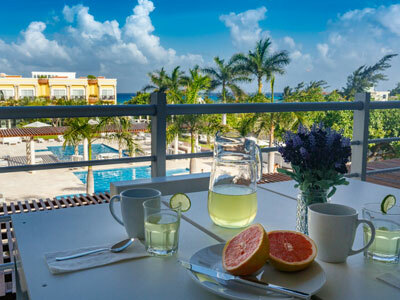 I enjoy telling people in the Bahama’s, “if you think this is nice you should check out the condo hotels in Playa Del Carmen…and you don’t have to drop a mortage paymnet each night to stay there. We have just left the fabulous El Taj. My husband Richard and I worked at the Waldorf Astoria Hotel in New York as Management and so we are well aware of what makes a hotel great. The food, service and amenities were fantastic and your staff was exceptional. I also worked for Leona Helmsely at the Helmsely Palace hotel and she would have been proud of your facility. We have shared all our wonderful photos of your condo on our facebook and do hope to return as soon as possible.